Commercial skipping and content discovery are coming to the amazon Fire TV recast. This is the sort of exciting stuff I thought youview next gen was going to bring... updates to youview next gen seemed to have become a trickle... little UI changes... and even then, not for all boxes! EVEN through that was promised... as a BT box owner, I still don't have Discover!!! @highdeftvfan 's post above prompted me to look back at my first impressions next gen day zero post. 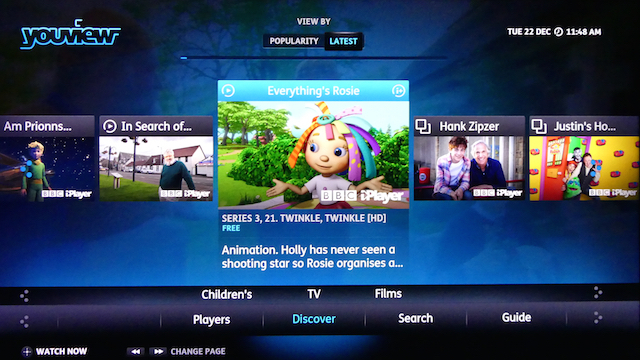 Whilst my subsequent notes there show some of the short comings listed there have had some attention from YouView (but not necessarily then reaching all boxes such as discover) there are still various notes of lost features or rough edges of next gen that are still unresolved almost 2 years now after it first launched. I'm comfortable and adequately satisfied with my next gen experience these days though so do not particularly miss old gen. That said there are the odd next gen issue or missing old gen feature that do niggle from time to time (e.g. being bounced out of MyTV on exiting a recording if 2 other recordings are underway utilising both tuners (which hits me several times a week), no jump to particular minute in a recording feature (not a big issue for me and something I might only use every month or so if it still existed)). There was of course plenty of room for improvement to old gen and much of the obvious and worthy improvements noted there remained unimplemented and still do now as noted in the consolidated list of improvements and feature requests. Pair this new 4K stick with the Fire TV recast and you have pretty hot feature set that BT, SKY, and Virgin are simply miles behind... and all of them currently have pricing structure far in excess of Amazon... but what about content like the Freeview channels, Amazon doesn't offer those... will yes and no, a lot can be obtained through supported apps like All4, iPlayer, etc. People have been making these kind of comments and claims for years on internet fora. But nothing ever happens. But @ ;highdeftvfan you've gone one step further by declaring sticks are going to kill traditional TV platforms period.... Personally I don't think so, so another wow. Youview killed its self by imposing new or next gen on those that didn't want an un finished 'upgrade". Still waiting for the promises that were made back when it was imposed to be kept. I just put my YouView box on to check this. Nope, not dead, by its own hand or by anybody else’s. Working fine, in fact, like up to 3 million others. I'm always surprised by users who declare YouView NextGen is poor, or sub-standard even, and yet two years later are still here.